Despite the rumors that the iPhone 8 would be late because of a lack of OLED displays, Samsung Display began production for the iPhone 8 this month, after Apple approved the prototype panels. Samsung is ordering parts to produce ~14.5m displays/month, once production begins. Note; Samsung has dedicated 30K substrates/month of a 6th Gen fab to Apple. Using the ½ 6th Gen production of 121 5.85” panels/substrate calculates to 14.5m panels/month. If Apple is expecting a 9/7/2017 announce date, which would be the same as the most recent iPhone 7, and a 9/16/2017 release date, and assuming that production begins mid-June, gross production would be 35m units by the release date and then 14.5 panels/month for the remainder of the year. The displays are shipped to Apple’s assembler, Foxconn although with a ‘new and different’ display leading to a ‘new and different’ Apple device, the initial productivity might be less than normal. 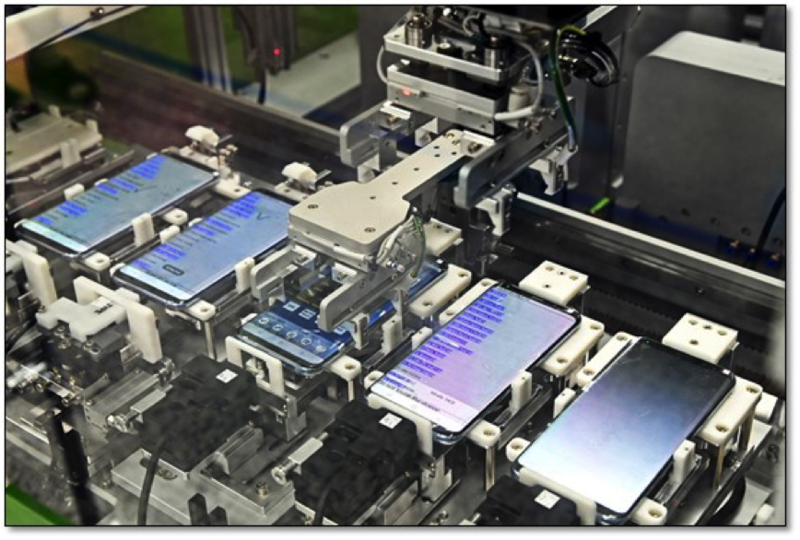 Samsung assembles its Galaxy phones itself in any of the nine assembly facilities it has in various regions around the globe. Once the device is assembled, which takes ~30 minutes, including the software install, they are passed to the test area. In theory, all devices are tested, but not all devices are run through all tests, which could add hours to the production time, but eventually the phones are packed for shipping robotically. Long-haul shipments of initial units (pre-release) will be sent by air if they must travel significant distances, but once the units are in full production and the initial consumer enthusiasm is satisfied, Apple will likely return to ship or automotive transport to lower costs. 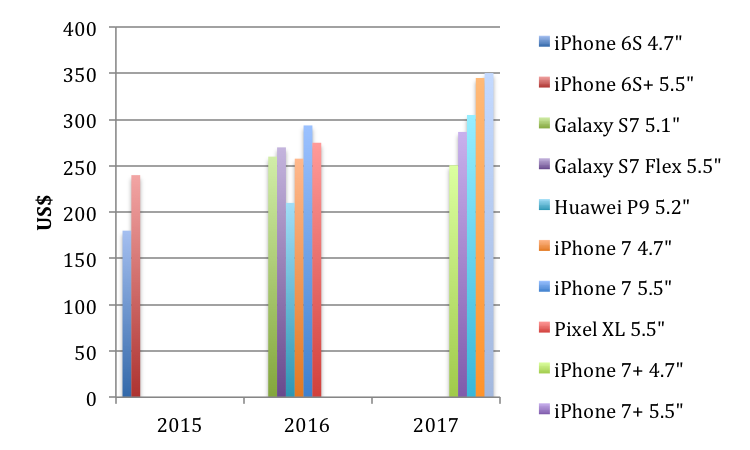 While speculation on the price of an anniversary iPhone variant continues, the cost of the phone, and hence profitability is Apple’s focus. We have costed the iPhone 8 at US$350.3 a 22% increase over the iPhone 7+. The Galaxy S8 has been cited as the most expensive smartphone to manufacture (among leading high volume smartphone models and brands) and Apple has tended to produce equivalent phones for between 10% and 15% less than Samsung Electronics. A second report from DigiTimes indicates Samsung is poised to deliver around 80 million OLED screens suitable for the "iPhone 8" before the end of 2017 —but a later than expected date for mass shipments for the phone is forecasted. DigiTimes reports Apple's order will take about half of Samsung's manufacturing capacity for the six months remaining until the end of 2017. Given a ½ year capacity of ~250m -300m units, it is more like 35% than 50%. DigiTimes expects that Apple will ship around 50 million of the "iPhone 8" before the end of 2017 —but will only have about three million on hand for the start of sales. The report claims that true mass production of the device won't pick up in volume until mid-September. The "iPhone 8" will have an edge-to-edge 5.65” OLED panel with a 5.1-inch user space — the rest dedicated to virtual buttons. Also expected is a new 3D facial scanner.